Google announced multiple APK support on Google Play, which allows you to transfer various forms of a APK file for a single app posting, instead of having to upload a single APK for each adaptation of your app. Explained in more detail below, is how this new feature can help solve some of your development issues when publishing to Google Play. At Google I/O, Google had announced plans to add several capabilities to help developers manage their products more effectively on Google Play. In particular, a very helpful publishing option – multiple APK support – is now available. With multiple APK support, you can have different versions of an APK file under the same product listing. The APK file versions are completely independent APKs that share the same product name, but contain code and resources targeted for your particular set of customers. Can we use an API level lower than X and still support Y? We want to create high graphics textures for X but other devices don’t support it and we don’t want to upload a separate application on Google Play. What should we do? Target older Android devices with one APK and newer Android devices with a different APK. The multiple APK support option helps you manage all the above tasks without uploading a separate application listing to Google Play with a different package name for one and other specific devices. Having this feature to support various devices (such as phones and tablets), Android platform versions, or screen sizes, all while keeping the application builds inside the same package and product name. If you’re new to publishing on Google Play, I’d recommended first going over the Preparing to Publish checklist and publishing on Google Play page on the Android Developers reference site to understand what you need to do if you plan to publish your application. 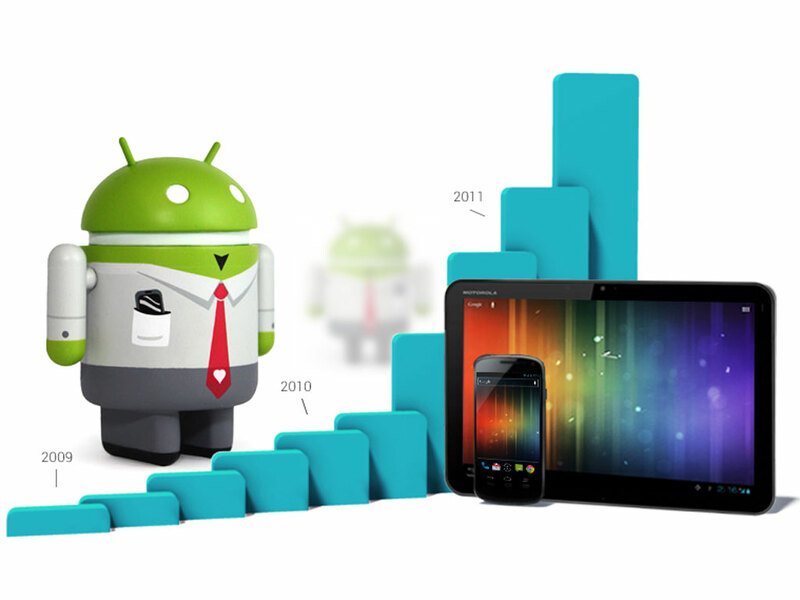 Also review the publishing concepts for Android Developers. 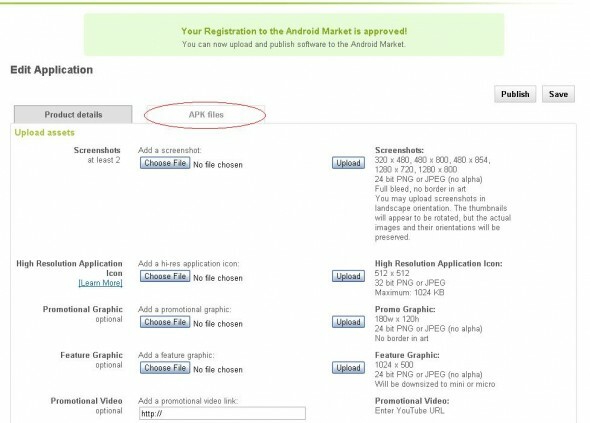 Here you’ll find a good explanation on key concepts regarding how the Android Market publisher site works, including descriptions on active APKs, simple mode versus advanced mode and the difference between “publish” and “save”. Most importantly, this page explains exactly how multiple APKs work. You will have just one entry in Google Play for your application, and different devices might download a different APK. You maintain one set of product details (app description, icons, screenshots, etc.). This also means you cannot charge different prices for different APKs. All users see only one version of your application on Google Play. 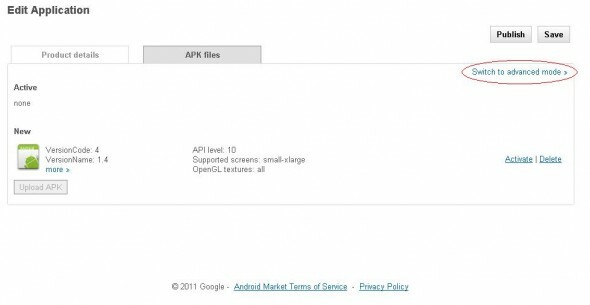 If you publish different APKs for different versions of Android, then when a user’s device receives a system update that qualifies them for a different APK you’ve published, Google Play automatically updates the user’s application to the appropriate APK. Assuming you’ve already prepared your application for publishing (including signing and versioning your application), you should be ready to publish on Google Play. 1. In the Product details tab of Edit Application screen, an Upload new APK window opens when you first begin uploading your software. Click the Choose file button to navigate to and select the APK file. 2. When your APK file is uploaded, click the Save button. 3. Go to the APK files tab of the Edit Application screen. 4. Click Switch to advanced mode. 5. 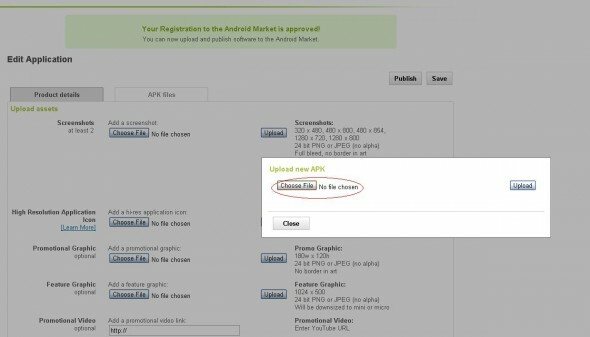 Click the Upload APK button and select the additional versions of the APK file to add. Select the Activate link to activate the APK. 6. When you are finished adding all the versions of your APK files for your application, click the Publish button to publish the APK files to Google Play, or click the Save button to save your files. 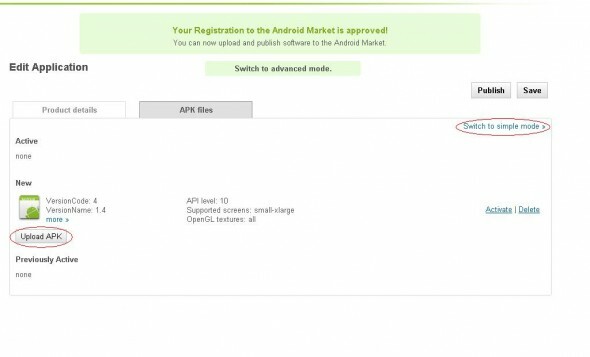 The description circled below indicates which devices running a particular version of Android (in this case, API level 10 or 8-10) will be able to download this APK. The information shown in the description is automatically extracted from the manifest file. We hope you take full advantage of the publishing options that the multiple APK support feature provides. If you have any questions, drop us an email. 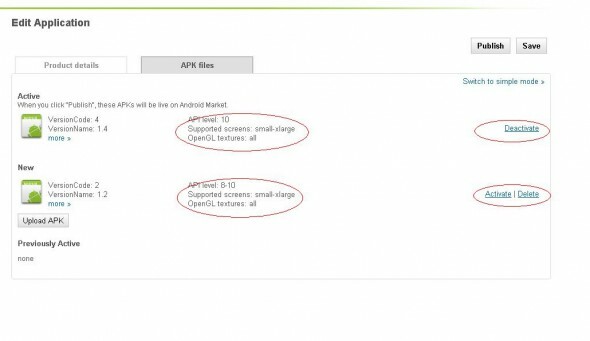 Learn about multiple APK support in detail on the Android Developers site. Review the Preparing to Publish checklist and publishing on Google Play page on the Android Developers site. 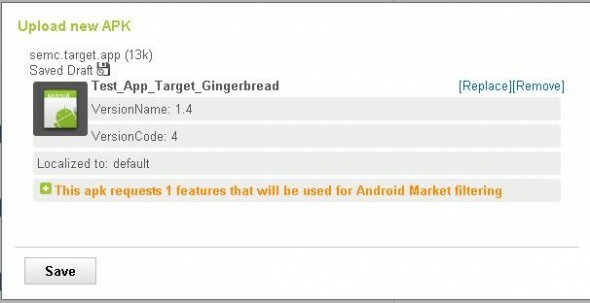 Read about multiple APK support on the Android Developers Blog.